Please find details about these colts anf fillies below. 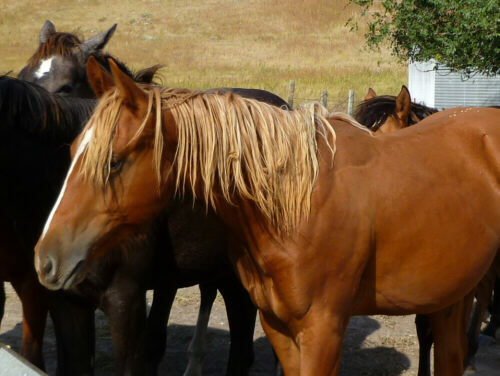 "Cash" is a pretty palomino gelding who is more on the laid back side with a very gentle nature. He is bred to work cows with Gallo Del Cielo and Dual Pep, two money earning sons of Peppy San Badger, right on his papers as well as several lines to Doc Bar and Smart Little Lena. With his calm disposition he will make a good trail or 4H horse too. He stands about 14.2 hands. Cash is halter broke and learning the basics in handling, he is ready to be started under saddle. "Plenty Cowsense" - her name sais it all. She is by our own son of Dualin Gun (NCHA points, son of World Champion cutting horse Dual Pep). Her dam Plentyofit Two Eyes is a proven ranch prospects producing mare. Still on her papers are famous horses like Doc's Hickory and Baron Jack. Bred to perform and also an in-your-pocket personality. 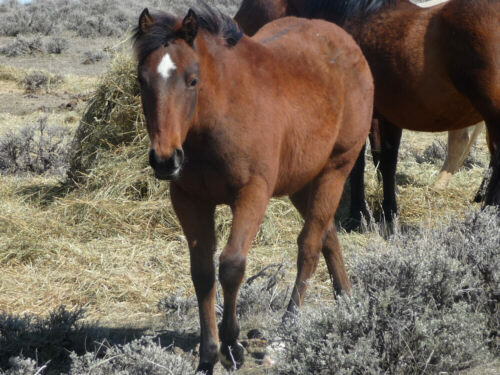 Dix is a very friendly filly who loves people. She has been handled a lot, leads, loads, trims, grooms, ties - she does know all the basics. She is coming two years old and I expect her to mature around 15 hands, more of a fine-boned horse with an exceptional pretty head and a very distinctive grullo color. She is very nice put together with straight legs and a well balanced top line. .. A granddaughter of Frosty Feature and Smart Like Lena; Smart Little Lena and Quilchina Bar on her papers - if you do not love to ride her you will sure love to breed with her! A very pretty bay yearling filly, well developed, stout and all hips - she is just a yearling and already build like a freight train. Frosty Smart Doc is located at a ranch south of Rapid City, SD. "Big" becomes another meaning looking at this filly. Born in June 2009, she would easily pass as a 3yr old. And still the proportions are right, this girl looks just like Papa, an own son of Paddys Irish Whiskey. 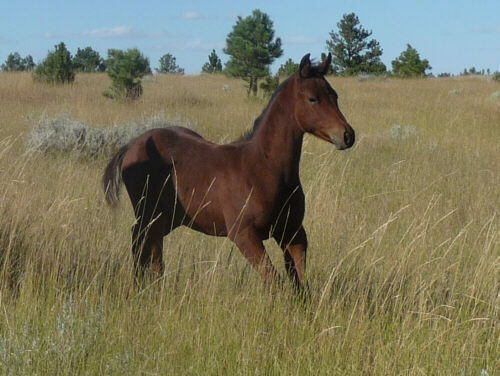 Her full brother is kept a stud and his first foal crop was born in 2010 (see on our 2010 foal page - his name is Paddysbarman, an exceptional stout build buckskin stallion). 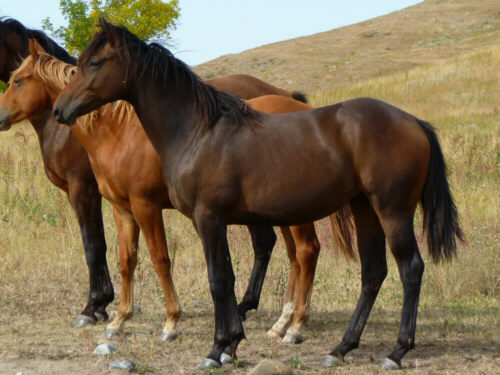 Paddys BDR Lady Two is located at a ranch south of Rapid City, SD. Not much to add to his looks and breeding. Coming from the best working cow and cutting lines in the industry; with Smart Little Lena, Peppy San Badger, Doc's Hickory, and Doc's Juniper right on his papers, this gelding is build and bred to perform. 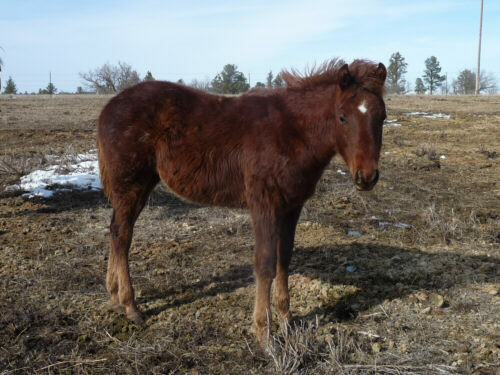 He is located at a ranch south of Rapid City, SD. He is my personal favorite. I rode his dam at a cutting clinic and fell in love with her - her son is the spitting image of her. Short backed and nice put together, and the blond mane sure doesn't hurt his looks. On his papers: Paddys Irish Whiskey, Peppy San Badger, Doc's Starlight, Doc O Dynamite, Doc O'Lena, Smokeys Gray ... what more needs to be said? Plenty Paddys Olena is located at a ranch south of Rapid City, SD. 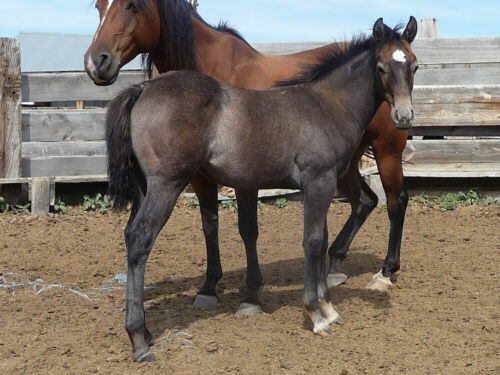 This gray stud colt has it all: looks, athletism, and the right blood lines. His dad is our proven herd sire Dorky Frosty Spark, an own son of Frosty Feature; and his dam raised exceptional cutting horses. 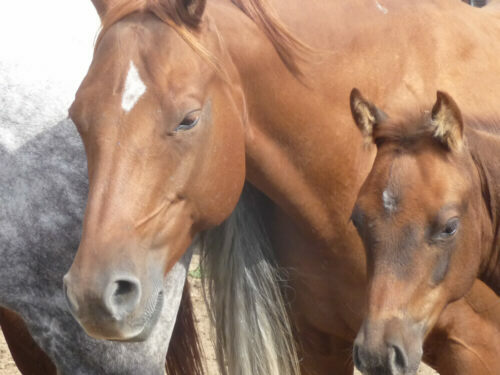 Her fillies never leave the ranch, they stay in the brood mare band after they were used in the arena. This colt's 2007 full brother is kept as a stud prospect. 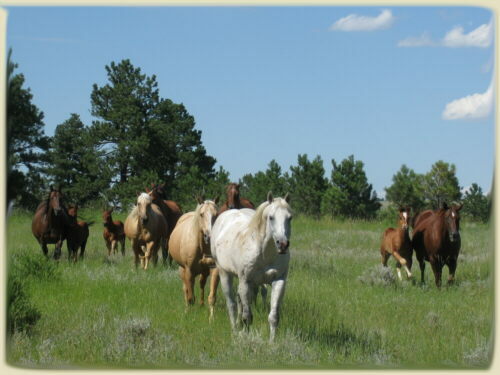 DocGloCuttersFrosty is located at a ranch south of Rapid City, SD. This gelding with the beautiful face markings is the friendliest horse ever. Even though he has not been handled, it is almost impossible to take a good picture of him since he is always too close. 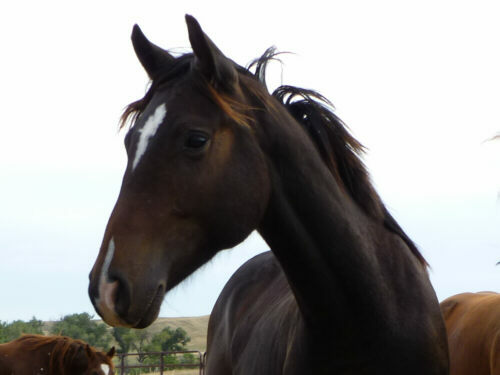 He is a fairly tall, very nice put together yearling colt. A grandson of Paddys Irish Whiskey and also cutting bred on the bottom. 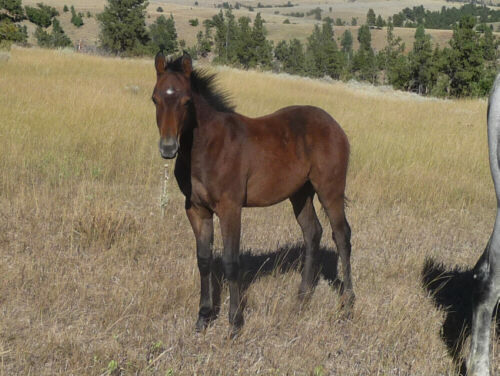 This is one leggy stud colt by our own son of Frosty Feature (Halter and Race points, known producer of barrel race prospects). His dam is a grand daughter of Mr Baron Bell (AQHA Champion sire) and Docs Jack Frost (sire of Sun Frost). This colt has conformation, cow and speed written all over his pedigree. 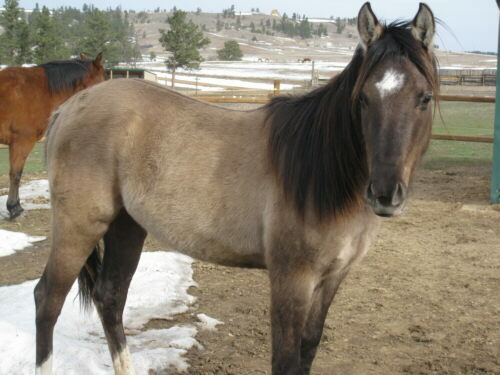 He has the fine Sugar Bar head, great withers and a mellow, curious yet laid back personality. Another great son of Dualin With Cows, our own son of Dualin Gun (NCHA points, son of World Champion cutting horse Dual Pep). 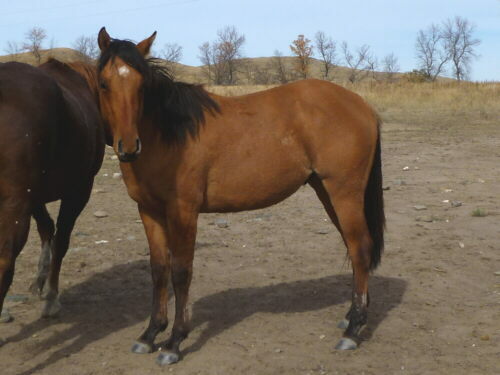 His dam is the daughter of our best broodmare, Tee Bar Jeep, a mare that throws stout, well build horses which perform great on the ranch and in the arena. Dual Pines Sabrette is an outstanding colt who will have some size to him. "Watch Golden Gun" is by our own son of Dualin Gun (NCHA points, son of World Champion cutting horse Dual Pep). He is very well put together with a friendly personality. One of our best looking 2009 foals. 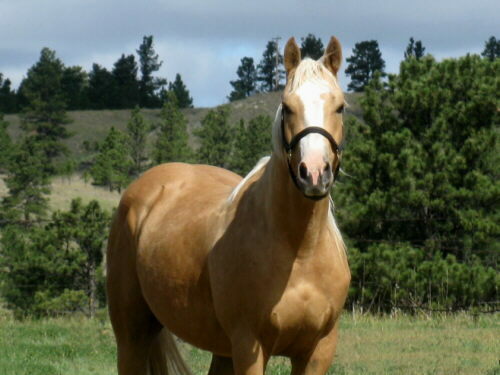 His dam is a pretty palomino mare whom's pedigree is filled with Working cow horse bloodlines. However, due to a glitch in the paper work he sells grade. June 25, 2009 dam . 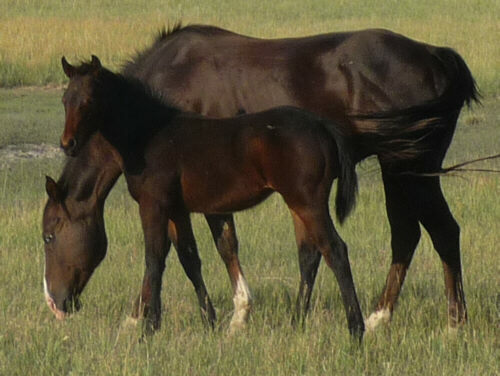 Ilrice, an own daughter of Super Te and some Thoroughbred on the bottom, is speedbred, but does add cowsense to her offspring too. She had three foals since we had her. 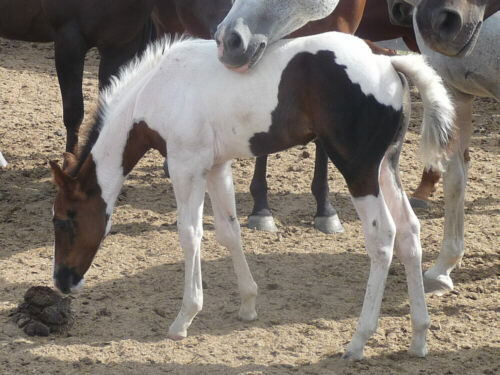 A true black stud colt, a very pretty bay tobiano filly (see her on the 2-year-olds-for-sale-page), and has a foal from an own son of Frosty Feature by her side this year, a pretty bay tobiano stud colt. Bred for speed on top and bottom - this guy may make your next arena prospect - and looks good doing it! He sells grade unless the buyer is willing to pay the APHA registration fees ($200 for complete paper work). French Sundance is a grand daughter of Frenchmans Guy and throws, bred with our own son of Frosty Feature, year for year very pretty headed barrel race prospects. Gypsy comes from the legendary King Ranch blood lines and is foundation bred through and through. 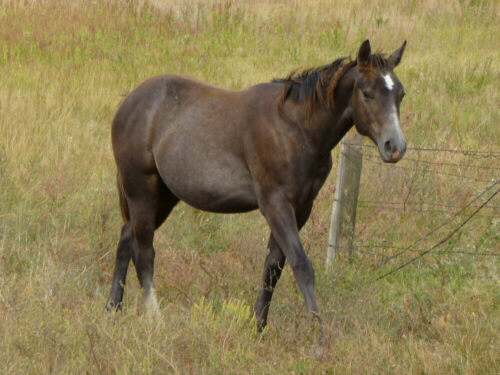 She is a very pretty dark chestnut mare with a flashy face marking. 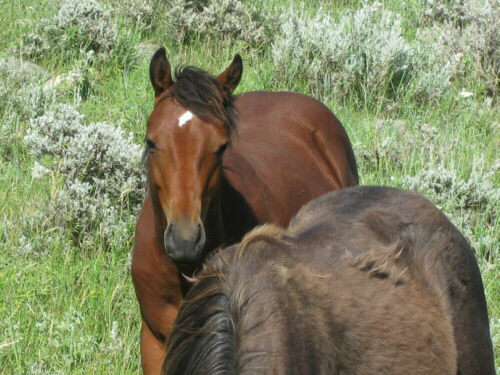 She has gorgeous 2009 chestnut or brown filly by Dualin With Cows, an own son of Dual Gun. 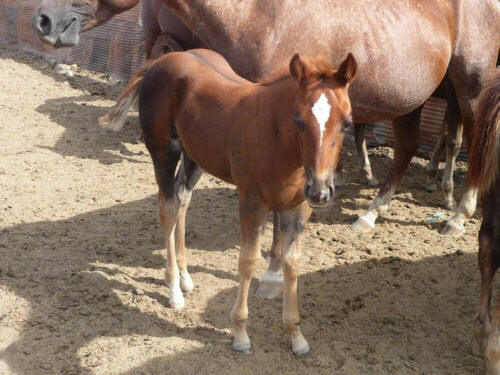 This spirited stud colt is by our own son of Dualin Gun (NCHA points, son of World Champion cutting horse Dual Pep). His dam is our best broodmare, Tee Bar Jeep, a mare that throws stout, well build horses which perform great on the ranch and in the arena. As pretty as can be - this stud colt by a grandson of Dual Pep and a foundation bred working cow bred mare is already stout and shapy. We will add better pictures of him as soon as taken. 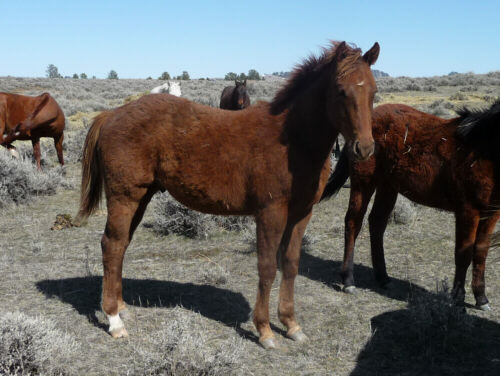 This stud colt has hips to die for! Sired by our own son of Dualin Gun (NCHA points, son of World Champion cutting horse Dual Pep) and out of a stout ranch mare with foundation breeding he is one who will watch a cow and look good while doing it. He has a friendly, curious personality that makes him the favorite baby of the herd. 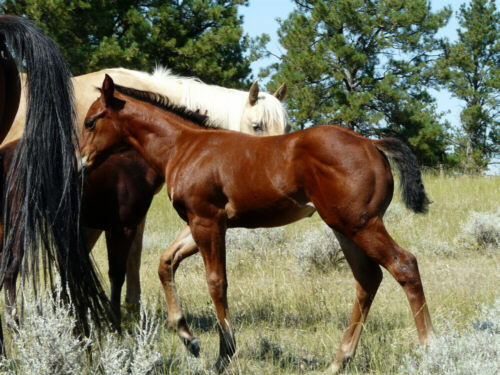 This flashy filly is by our own son of Dualin Gun (NCHA points, son of World Champion cutting horse Dual Pep). 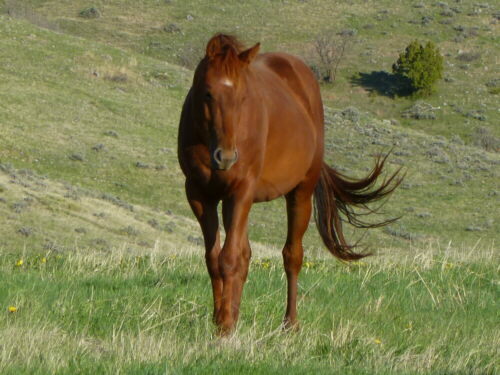 Her dam produced an outstandig red roan stud colt in 2007. This filly has the same athletic build than her dam and with the cowyness and quickness from her sires side she should be able to go in any direction you take her. "Kasil" is by a straight Egyptian Arabian stud and out of a daughter of a world champion Half Arabian Pleasure horse. He is registered with AHA in the Half Arabian Registry. 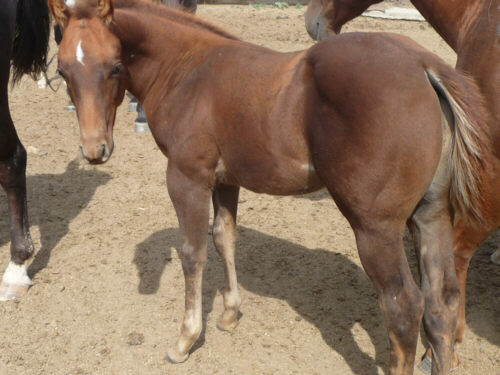 This weanling has more than 90% pure Arabian blood but acts like a much cooler blood type! He is halter broke, leads, ties, takes his wormer, picks up his feet and has been trimmed regularly. Kasil is tall for his age (born June 2009) and stands already 12.3 hands, we expect him to mature around 15 hands. Correct conformation with straight legs and a great disposition to boot. Please check his pedigree at http://www.allbreedpedigree.com, his registered name is KASIL GOLD BLUE. 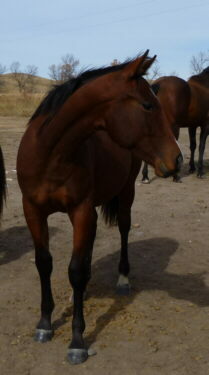 His sire is Cheroke Gold, an own son of the legendary Egyptian Arabian Thee Desperado. His dam is a daughter of the 87.5% part bred Arabian MJD Corona De Oro, a US National and Scottsdale Champion in Western Pleasure, who just changed ownership for $38,000. "Featuring Hickory" is by our own son of Frosty Feature (Halter and Race points, known producer of barrel race prospects). His dam is a half sister of our Palomino stud "Plentyofit Freedom" (see his offspring at the 2007 foals page). 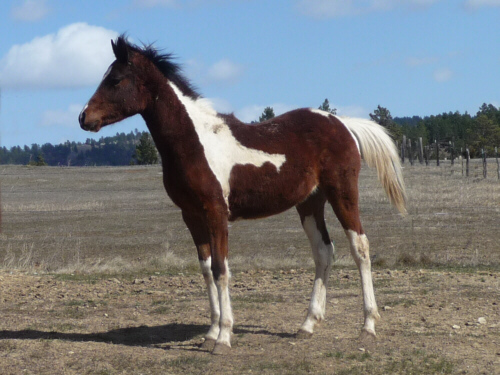 She is a granddaughter of Doc's Hickory - with speed on top and cow on the bottom this stout build colt will out run any cow - or barrel! "Lacy Poco Pep" is by our own son of Dualin Gun (NCHA points, son of World Champion cutting horse Dual Pep). Her dam Gold Lacy Poco is a proven ranch prospects producing mare. 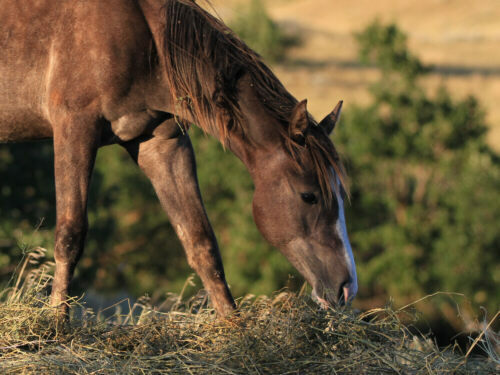 Her pedigree goes back to famous horses like Cutter Bill, Seven Bars, and, of course, Leo. This filly has a lot of size to her. Windy is a friendly filly, comes up to me every time I visit the horses in the pasture. She has a flawless conformation, very nice put together and will get some size despite her cutting breeding from her sires side. 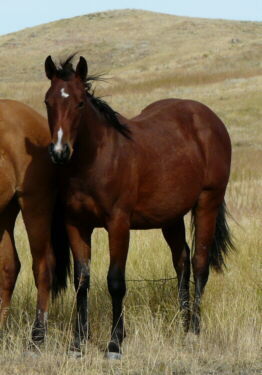 This girl is raised to become a great ranch and trail horse and has the bloodlines to back her up. Dual Pep on her papers, and Mr Tailwind and JB King just slipped off.